We help people play the relating game so each person wins. Does Your Relationship have a Third? Most of us are accustom to relating as if there is only you and me in relationship, because that is all we perceive via our five senses. This leads to the belief that the full extent of what is going on between you and me is what each of us says or does and hears or sees. But what if there is actually something more going on in every relationship, a relational field that informs everything that goes on between us? This field, which represents a Third presence in the relationship, contains an infinite set of perspectives and possibilities for every situation – ones that most of us are not accustom to seeing. The truth is that our bodies communicate with and through a relational field via subtle sensations, where the communication is just below our normal level of consciousness. This complex communication informs a lot of the dynamics that occur in relationships – everything from spontaneous attraction or repulsion to trust or mistrust to sensing each others’ emotional state to the creation of behavioral and relational patterns. – it opens us to the infinite possibilities available in the relational field. Although we are all capable of creating coherence in our relationships, we have not been taught how to do it consciously and to maintain it for extended periods of time. – we are consistently invited into the mystery of the unknown and often, this leads us to something vastly different than what either of us thought was possible. We help people access Third Consciousness in all of their relationships to expand into everything that relationships can offer. We do this by teaching how this level of consciousness transforms relating challenges into magical opportunities. We also offer exercises and practices that help clients and students reliably achieve conscious coherence, and cultivate this ability to do so more and more often as they move through life. Get support in unlocking everything that your relationships have to offer you by contacting us today. We believe that Rumi was talking about the relational field. 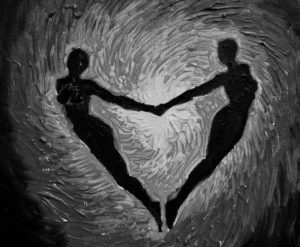 Third Consciousness allows us to embrace our partners as an ally in finding those barriers.